What you're witnessing is monsters dying as fast as they're spawning. I couldn't even click them. For the uninitiated, Clicker Heroes is a massively popular Steam game that nearly plays itself. Monsters appear on screen, and then you click them until they die. Or they die on their own, more quickly depending on your total DPS (which you can continually improve by spending gold). I left my game running overnight, and when I came back I had so much gold that Scrooge McDuck would have drowned in it. So I spent it all, but I never left the stage I'd been on that whole time. As a result, my "heroes" were all massively over-leveled. Merely existing in my presence proved fatally corrosive to all monsters. It was like they'd seen the face of god, only with less melting and more money pinata explosions. I guess it's those little things you take for granted, or forget about when your monsters take like 5 minutes to die on their own. oh yeah, and unlike Cookie Clicker, you don't need to leave it running. 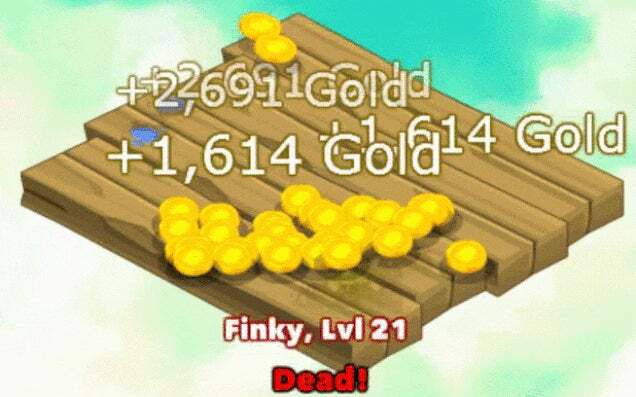 Clicker Heroes is sweet in that you get gold when you don't have it open. So Cookie Clicker with levels? When I was first about to try this, I thought "how stupid"... but from the moment I started clicking, I found that I could not stop. This was last year, and I managed to pull out before 5 days had past, thank god. This is now officially the most played game in my list on Steam. That is disgusting.